Built in the 1980’s as affordable housing to first-time home buyers, this duplex apartment was designed with small separate rooms for each programmatic function: dining, cooking, bathroom, laundry, etc. Our strategy for this renovation was to reconfigure the kitchen/dining and main bathroom/living space in order to maximize the spatial experience of the residence. We removed the walls that divided cooking from eating to integrate these activities. Opening the space required the kitchen components to be both concealed and integrated. Functioning also as the main entry of the apartment, it was important that the design be subtle in purpose, but strong in presence. Challenging ourselves to balance a functional kitchen with a visible one, we created design opportunities such as foot pedals to operate the faucet and the use of color and illumination to activate. Two elements organize the kitchen: a wall of orange cabinets serving as the main storage for food and the refrigerator, and an island with built-in appliances. 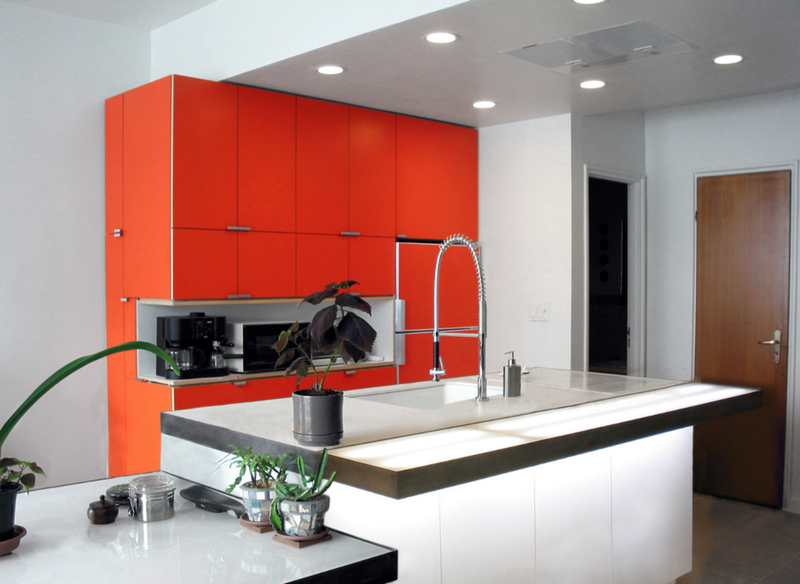 Within the orange, a white cutaway keeps all the counter-top appliances accessible. The counter of the island and rolling dining table is white milk glass with integrated lighting for evening illumination.